Aboriginal and Torres Strait Islander peoples have existed on the continent of Australia for tens of thousands of years. Their art and traditions are among the oldest and richest in human history. The designs, patterns and stories were taught to Indigenous Australians by the Ancestors and are reinforced and replicated through ritual, dance, song, body painting, rock engravings and paintings, and on domestic and ritual objects. Aboriginal and Torres Strait Islander art is as alive today as it was thousands of years ago. As in the ancient past, the art is inseparable from everyday life. The art of contemporary Indigenous Australians takes many forms. Despite significant change and diversity, the art retains an underlying unity of inspiration—the land and the peoples’ relationships with it. It is simultaneously connected to the past and engaged with the present, engaging with the world through actions which are lively, positive, political, social and creative. The Kimberley region of Western Australia is renowned for the Wanjina figures painted on rock walls, a tradition dating back thousands of years. The Wanjina Ancestors are responsible for bringing rain and providing regrowth and renewal for the Aboriginal people of the area. 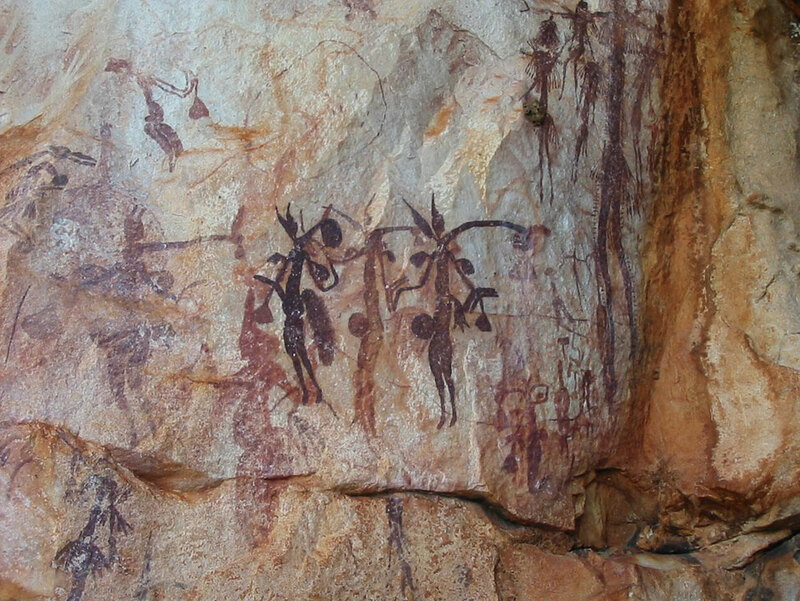 Within the Kimberley region of Western Australia there are many distinct artistic styles. The interlocking geometric patterns that adorn ritual and decorative objects—such as shells, shields and spearthrowers—from the western Kimberley are a feature of the work of contemporary artists from the Balgo and Fitzroy Crossing area. From the early 1980s, a new art tradition emerged led by Paddy Jamiji and Rover Thomas who introduced bold textured and ochred landscape paintings of country and of significant historic events. Acknowledgement: National Gallery of Australia for the above information. I am so impressed with the Kimberley Foundation Australia's scientific research into the extraordinary rock art in the Kimberley. It is only by such painstaking work that will we find some answers to the mystery of these ancient paintings and learn more about our human beginnings.